France. (2008). In Philip's encyclopedia. [Online]. London: Philip's. Available from: https://search.credoreference.com/content/topic/france [Accessed 21 April 2019]. "France." Philip's Encyclopedia, Philip's, 1st edition, 2008. Credo Reference, https://search.credoreference.com/content/topic/france. Accessed 21 Apr. 2019. 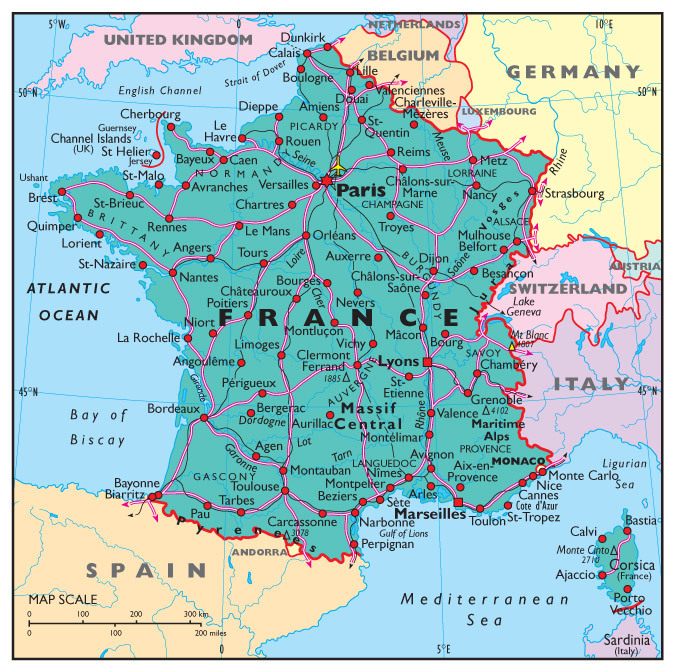 The Republic of France is the largest country in Western Europe. The scenery is extremely varied. The Vosges Mountains overlook the Rhine Valley in the NE, the Jura Mountains and the Alps form the borders with Switzerland and Italy in the SE, while the Pyrenees straddle France's border with Spain. The only large highland area entirely within France is the Massif Central between the Rhône-Saône Valley and the basin of Aquitaine. This dramatic area, covering one-sixth of the country, has peaks rising to more than 1,800m [5,900ft]. Volcanic activity dating back 10 to 30 million years ago appears in the form of steep-sided volcanic plugs. Brittany (Bretagne) and Normandy (Normande) form a scenic hill region. Fertile lowlands cover most of N France, including the densely populated Paris Basin. Another major lowland area, the Aquitanian Basin, is in the SW, while the Rhône-Saône Valley and the Mediterranean lowlands are in the SE. The climate varies both from W to E and from N to S. The W comes under the moderating influence of the Atlantic Ocean, giving generally mild weather. To the E, summers are warmer and winters colder. The climate also becomes warmer as one travels from N to S. The Mediterranean Sea coast experiences hot, dry summers and mild, moist winters. The Alps, Jura and Pyrenees mountains have snowy winters. Winter sports centres are found in all three areas. Large glaciers occupy high valleys in the Alps. Julius Caesar completed the Roman conquest of France, then known as Gaul, in 51 bc. The Roman Empire began to decline in the 3rd century ad. In 486 the Franks, led by Clovis I, established a Christian kingdom and the Merovingian dynasty. Following his death, the kingdom fragmented. In 687, the Carolingians reunited Gaul and Pepin III (the short) overthrew the Merovingians (757). His son, Charlemagne, succeeded in 768 and was crowned Emperor of the West (800). Through conquest, his empire extended from central Italy to Denmark, and from eastern Germany to the Atlantic Ocean. Following his death the empire was divided up, and in 843 his grandson Charles II (the Bald) became ruler of the area of present-day France. Hugh Capet is often seen as the first king of France (987), and the Capetians gradually subdued the nobility. The Norman Conquest (1066) marked the start of a long history of Anglo-French rivalry. Philip II regained land lost through dowry to the English. In 1328, the first Valois king, Philip VI, acceded to the throne. The Hundred Years' War (1337-1453) was a series of battles for the French succession. By 1422, England controlled most of France. Joan of Arc helped to crush the siege of Orléans (1428) and by 1453 England had been expelled from France. In the course of the war the French kings lost much power to the nobility, but Louis XI (r. 1461-83) laid the foundations for absolute monarchy by restoring royal authority and crushing the Angevins. Francis I's reign marked the beginning of the Renaissance in France and the struggle with the Habsburgs. The rise of the Huguenots led to the Wars of Religion (1562-98). The Guise faction lost, and Henry IV became the first Bourbon king (1589). Cardinals Richelieu and Mazarin led France to victory in the Thirty Years' War (1618-48). Louis XIV's court at Versailles was the richest in Europe. Yet the ancien régime of Louis XV and Louis XVI was bankrupted by war and incapable of reform. The French Revolution (1789-99) saw the execution of the king, and Robespierre's brutal Reign of Terror. The Directory ended when Napoleon I proclaimed himself Emperor (1799). The success of the Napoleonic Wars was wiped out at Waterloo (1815). Napoleon was forced into exile and the Bourbons restored to the throne. The February Revolution (1848) established a Second Republic. Napoleon I's nephew seized power as Napoleon III (1852). His defeat in the Franco-Prussian War (1870-71) led to the formation of the Third Republic (1875-1940). The Paris Commune (1871) was violently suppressed. The Dreyfus Affair polarized France. Rapid urban growth has resulted in overcrowding and the growth of poorly built new districts to house immigrants, especially those from Spain and N Africa. The 4 million underprivileged workers from the Maghreb became a major political issue in the 1990s, leading to political successes in some areas for the extreme right. Other problems faced by France include unemployment, pollution and the growing proportion of elderly people. A socialist government under Lionel Jospin was elected in 1997. He increased the minimum wage, shortened the working week, and adopted the euro. However, in 2002 centre-right parties won a resounding victory and Jean-Pierre Raffarin replaced Jospin as Prime Minister. France has a long record of independence in foreign affairs and in 2003 it angered the US and some of its allies in the EU by opposing the invasion of Iraq, arguing that the UN weapons inspectors should be given more time to search for weapons of mass destruction in Iraq. France's stance angered some US congressmen who called for a boycott of French goods. The number of US tourists to France also fell. A resounding 'no' vote in the referendum on the European constitution in May 2005 led to the resignation of Raffarin and his replacement by Dominique de Villepin and further decline in the relationship between Jacques Chirac and Tony Blair over the UK rebate and Common Agricultural Policy subsidies for French farmers. Unemployment is a major problem, particularly among the young. 2006 attempts to liberalize the labour market led to widespread rioting. France is one of the world's most developed countries. It has the world's fourth largest economy. Its natural resources include its fertile soil, together with deposits of bauxite, coal, iron ore, oil and natural gas, and potash. France is also one of the world's top manufacturing nations and it has often innovated in bold and imaginative ways. The TGV, Concorde and hypermarkets are all typical examples. Paris is a world centre of fashion industries, but France has many other industrial towns and cities. Major manufactures include aircraft, cars, chemicals, electronic products, machinery, metal products, processed food, steel and textiles. Agriculture employs about 2% of the people, but France is the largest producer of farm products in Western Europe, producing most of the food it needs. Wheat is a leading crop and livestock farming is of major importance. The food-processing industry is well known, especially for its cheeses, such as Brie and Camembert, and its top-quality wines from areas such as Alsace, Bordeaux, Burgundy, Champagne and the Loire valley. Fishing and forestry are leading industries. France is a popular year-round destination both for its beaches and for its mountains.